Duncan Gunter at his town hall from hell March 11, 2017 at Ramona MainStage. This is an annotated version of Duncan Duane Hunter’s March 11 town hall keyed to Bethany Amborn’s video posted on Facebook. It’s not a complete transcript — but it’s close — done in academic transcript form using oral history techniques. Commentary is indicated by italics within brackets. Other breaks in the transcript, but pertaining to the town hall verbiage, is indicated in parenthesis. Approximate time in the video is indicated to the left. For now, you’ll have to follow the link below. As soon as the embed code is available publicly, we’ll have the video displayed below. -1:19:54. The Department of Justice was full of people who were sympathetic to the Obama administration policies of any kind of immigrant coming in whether they were a criminal or not. -1:15:37 (Obamacare BS) Trump is going to build the military back up…North Korea is not going away. Iran is going to have nuclear weapons…We’ve had eight years of gutting the military. -1:14:43 Let’s shake up the buckets. -1:08:15. “We’re going to do more of these. We’ve had a very busy two months making America great again (mixed boos and cheers). — 1:07:12 (Michelle Shieu: Will you vote to dismantle the EPA) “We are the champions my friends” starts singing….Here’s what the EPA has done. They’ve destroyed American business…(massive booing) There’s a way to have clean air and clean water using common sensical principles. -1:02:12 This is what President Trump is going to do…(booing) For the first time ever we’re going to put Americans first. Wy can’t we put Americans first for once. That’s what Trump is doing. We’ve been worrying about the rest of the world for eight years while our country…infrastructure now has been going down. -1:00:30 I’m going to sit down. -59:55 Q: Campaign spending…”Here’s what happened. Last year I found out that there were mistaken charges on my campaign and I found out in the report that we come out with every year. As soon as I saw those I paid back immediately $12,000 then did an internal audit on my campaign finances. An internal audit. We then payed back another $50,000. That includes everything. We paid back about 130 percent of what my own internal audit came out with. I announced it prior to the election. We’ve been transparent about the whole thing. These were mistakes that were made by my campaign. that I paid back immediately. Let me put it this way. I am going to be the only congressman in the last two years who hasn’t taken any mileage reimbursement. (crowd buzzes) No literally, the only congressman in congress with no mileage reimbursement. -58:27 I would charge my mileage on my card. Instead of charing on my personal credit card I would charge it on my campaign card when going to campaign events.The campaign finance stuff I was not watching close enough. I have fixed it now. It’s all straightened out. -57:34 I’ve taken responsibility for it. I’ve fixed it. End of story. —57:08 Woman working with people w/disabilities, concerned about the health care bill. —54:00 The repeal and replace as it stands now is OK. We’ve done as much as we can do through the reconciliation process to repeal Obamacare. Obamacare is simply a takeover of the health care business by the US government….Democrats goal when they passed this was make the US Government control your health care….Probably going to vote for the repeal bill…Home savings accounts and tax credits…,Thanks God we have Tom Price….allow insurance be sold across state lines, needs 60 votes. — 49:30 (In rather bizarre move, brings up Dr. James Veltmeyer.) He ran for congress agains Susan Davis, I’m going to give him two minutes. (LOTs of commotion and anger…crowd chanting answer the questions at Duncan…) Veltmeyer talks about immigration for some reason…Duncan accuses the crowd of being disrespectful. —43:58 (Names of people who submitted questions were called, but they’re all outside. Hunter appears to give up and has an inside audience member ask a question. She asks him to commit to another town hall meeting at a “more appropriate” venue. applause) “I think this a pretty rad venue but the answer is yes ,but not in April necessarily….We’ll post it everybody will know. It will be great again. Lady: We don’t want it in October or Christmas. We’re asking for a commitment for this spring. “In California Medicaid ranks I forget the number, either 48th or 49th out of 50 states in the amount that they match for Medicaid. -33:12 We have the Office of Congressional Ethics. Number one, it was created by Nancy Pelosi, that’s all you need to know. (Booing.) Number two, it is a fairly liberal group…The OCE stuff on me that they were feeding the Union Tribune which is owned by the L.A. Times. I don’t think the way they go about business is a good way to go about business. -31:08 First mention of the liberal media…(Gets negative feedback) Yeah, you’re right, the media’s perfect. -25:43 (Oops moment) Hunter beings “Before tramp, er before Trump” (Lots of laughter and applause) “Before Trump won he talked about working with Russia and against ISIS. It’s nu surprise that after he got in…wants to work with Russia to crush ISIS…Marine artillery instead of army fast in, fast out, we’re not going to nation build. We’ll chew you up, you won’t do it again..Travel ban is going to go through… The other one (Trump) did kind of by the seat of his pants. This one’s better. -21:00 Claims Obama put Iraqi translators “at the back of the line, really…Syrian refugees who are not vetted come over before Iraqis that served in the US Army basically for years. I’m just telling you how it is, you’re booing Obama right now…” Wants Iraqis who served with US and their families to be allowed in. -13:00 “We know it’s going to disrupt the market. I don’t believe in guaranteed health care. I believe in access to health care that anybody can afford….back to state block grants for those who can’t afford it. Mainly for the first few years to lessen the impact of losing Obamacare..Argues about health care in France which is cheaper, he says it’s not good. 10:40 Except for national security and border security, my job is to get the federal government out of our lives. 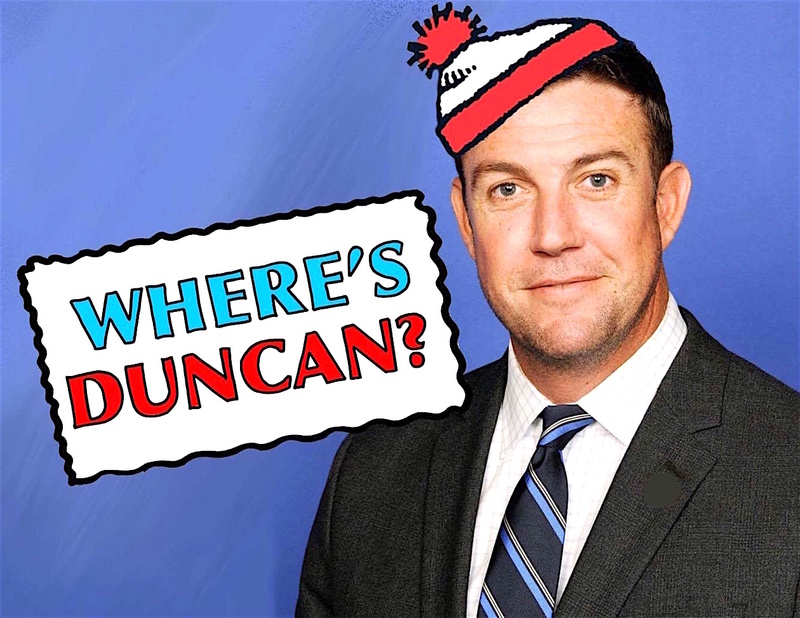 Be the first to comment on "Duncan Duane Hunter town hall (annotated)"